My last night in Hyderabad, 100 people gathered at the Acumen Fund offices for an informal community event at which I and my colleague, Karthik Chadrasekar, spoke. It’s always exciting to see such a large turnout and interest in our work, and I was struck particularly with the number of people I met who are working on entrepreneurial ideas to deliver power and light. It’s not surprising, given the staggering numbers: 500 million people in India alone without reliable power (and 3 billion globally); 1.5 million deaths annually from indoor air pollution; and the poor typically spending 15% of their income on dirty, low-quality fuels – more than is spent on healthcare or education. But of course all big solutions start at the beginning, not the end…with one system or pilot or idea that works so well that it is built to grow. And to make it all happen, you need the right person, or people, with a vision of how to make the impossible possible. The idea behind Husk Power Systems came from Gyanesh Pandey who, together with his partner Ratnesh Yadav, began tinkering with renewable fuel solutions for the poor in 2002. By 2007, Gayanesh and Ratnesh had settled on biomass as their preferred fuel source and had set up shop in the Indian state of Bihar, where Gyanesh is from. Bihar is part of India’s “rice belt” so rice husk is abundant, as is poverty. But no one had ever built an end-to-end system here that generates power and delivers it to villagers’ homes at an affordable price. Husk Power Systems began as an NGO, the Samta Samriddhi Foundation, that built one mini-system and wired the surrounding village. 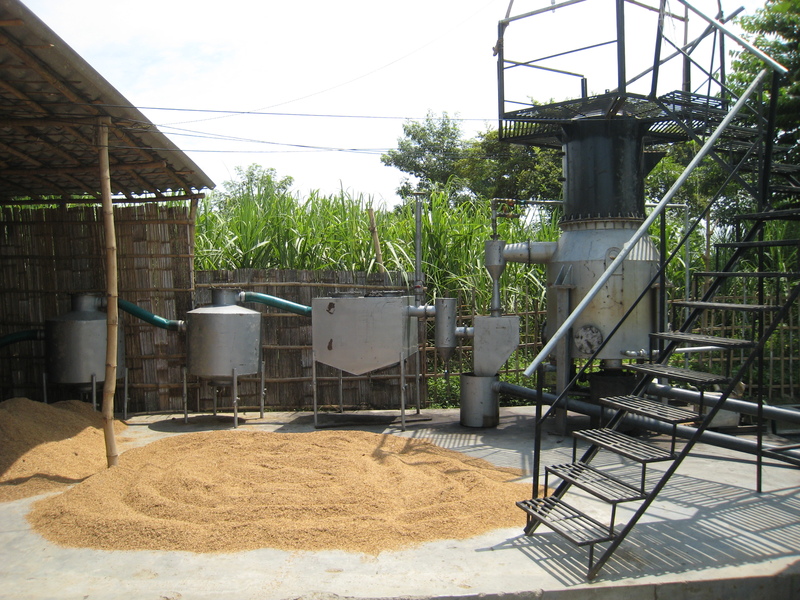 The system uses rice husks to power turbines to create electricity, and the business model is powerful in its simplicity: create small-scale infrastructure (wires to thatch homes strung on bamboo poles); a predictable and reliable power supply from 6pm to midnight; and sell customers two CFL (compact fluorescent) bulbs at a price that they can afford. Or, as it is sold to the villagers: the cost of electric light to your home (which has never been delivered in the thousands of years this village has been here) is 300 rupees for the connection (about US$6) and less than 100 rupees (US $2.50) per month. In every village we visited, house after house after house was bathed in the cool blue glow of CFL lights. Homes in villages that had been dark or powered by kerosene for thousands of years were lit up. And not just some of them. Nearly ALL of them. 80% or more of them in every village we entered. Demand – for this product, with this reliability, at this price – is not an issue, which sets Husk apart from nearly all of the businesses that serve the poor in the developing world. This helps explain the pace of Husk’s growth: they had two systems installed by the NGO by early 2008, and a little more than 2 years later they have nearly 50 systems serving more than 100,000 people and growing at an accelerated pace. The plans to scale are aggressive, with the goal of reaching hundreds and then thousands of systems in the next few years. And that will bring its own challenges – of acquiring more turbines and building and maintaining more systems and building the salesforce and collecting payments from customers and training thousands of mechanics. But what I find so exciting is to see a business serving the poor with a core model that works so well, one in which promise of meeting a need is matching up with the reality on the ground – high demand , hugh penetration, and high satisfaction from low-income customers, with underlying economics that work. Having seen hundreds of businesses around the globe that aim to do just this, I know how rare it is. And if business solutions to poverty are going to work on any sort of scale – not just delivering products to some but addressing social issues at their root – we need to start asking ourselves this question of market penetration. All too often we look at the company level and ask if it is selling enough at a low enough cost to make the business work. This itself is hard enough. But for so many social problems, large-scale change will only come when market penetration (even if the market is just one village) – for safe drinking water, primary education, sanitation, vaccines, maternal care, etc – reaches 70%, 80%, 90%, even 100%. It is this depth of adoption that will fundamentally alter the infrastructure of people’s lives. Lots of inspirational moments today at the Global Philanthropy Forum (live webcast here). Among other inspirations, Aravind’s founder Dr. Venkataswamy attended McDonald’s Hamburger University to learn about standardization and quality control. When we talk about scale, innovation, doing the impossible, creating massive change to fight preventable illness, this is what we mean. A closing thought, shared by Dr. William Foege (who among other things is credited with creating the strategy that eradicated smallpox): philosopher Soren Kierkegaard tells a parable of two robbers who entered a jewelry store and stole nothing; the only thing they did was switch the price tags between the costume and the real jewelry. The customers never noticed. So too, Dr. Foege opined, in the modern world the price tags have been switched. We ascribe the highest value to a small group of people who receive exceptional, unprecedented levels of monetary reward, and consistently undervalue the work of nurses and teachers and social workers and people who live lives in service of others.